Do you find yourself trying to avoid sugary foods for most of the day but then end up bingeing on a king size candy bar or a 32 oz soda? Maybe you go a couple of days without eating sugar, but then you “treat” yourself to a big dessert or some donuts? Perhaps you’ve managed to cut back on sugar for a while, but you’ve noticed that you’re drinking more beer or wine instead. Also, if you went without sugar for a while and started to feel depressed, anxious, moody or sleepy, and were able to relieve these symptoms by eating sugary foods, this could indicate a serotonin disruption caused by bouts of excess sugar intake. While the use of the term “addiction” in regards to food is somewhat controversial, recent studies with rats found that the bingeing behavior associated with drugs looks neurologically similar to that seen with bingeing on sugar. Like recreational drugs, excess sugar intake can cause an increase in the release of dopamine, triggering the brain’s pleasure center. The repeated flooding of dopamine results in a desensitization of dopamine receptors, creating a need for more sugar or some other dopamine activating stimulant. Based on the correlation between increased refined sugar consumption and higher rates of obesity (and in light of studies on sugar addiction using rats), many researchers are starting to believe that obesity may be connected to food/sugar addiction. Fructose in particular might be an especially significant cause of weight gain and “sugar dependence” as it’s extremely sweet and doesn’t provide the feeling of satiety that glucose and sucrose do. If you think you might have an addiction to sugar (recognizing it is the first step! ), the best thing to do is to start reducing your sugar consumption. When you get a craving, eat a highly nutritious meal rich in protein, healthy fats, and some glucose instead. Eating good food, getting sunshine, and exercising can all help balance the body’ dopamine and serotonin levels and promote an overall sense of wellness. The yogurt sitting in your refrigerator seems like a modest health choice but may not be as wise as you think. True, yogurt is a great source of protein, probiotics, and potassium, but it can also be an unwanted source of sugar. Have you looked at the nutrition facts on your favorite yogurt lately? All yogurt, even plain, will contain sugar because of the lactose in milk. However, a six-ounce serving of a typical flavored yogurt can easily contain 17 grams of added sugar! Compare that to the 17 grams of sugar found in a Pop-Tart, and a supposedly healthy breakfast heads into a downward spiral real quickly. 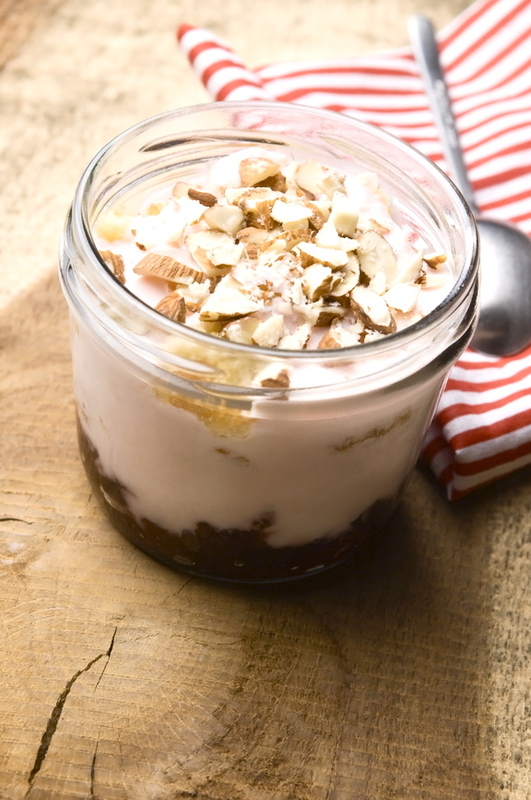 Wondering about the recent Greek yogurt trend? If you’ve been picking out Greek yogurt instead of regular, you should still be cautious of those tempting honey- or fruit-flavored Greek yogurt options. Flavored Greek yogurt still has about 12 more grams of sugar than plain Greek yogurt. The best choice is to stick with plain and add your own mix-ins at home. Stir in some fresh or frozen berries, some homemade granola, or even add a teaspoon of honey (containing 4.5 grams of one of the healthiest forms of sugar) or organic jam–the few grams of sugar from honey or jam will be much better than the 17 grams found in the flavored yogurt! It may take a little while to adjust to the tartness of plain yogurt, but it’s worth the effort and you may find you soon develop a taste for it. To read our article on yogurt’s health benefits, click here. Have you ever wondered if drinking orange juice is as healthy as eating the whole orange? Perhaps you haven’t, but many people seem to think that drinking a serving of fruit juice is equivalent to eating a serving of whole fruit. This misunderstanding is reinforced by claims the USDA allows fruit juice companies to make on their products, such as “One serving is equal to one serving of fruit.” I’m not quite sure how the USDA arrived at supporting such a statement (probably because of the lobbying pressure from large food companies), but to say what is in some cases little more than liquid sugar is equal to a serving of whole fruit is preposterous. Don’t get me wrong, some juices are better than others, such as the less refined ones that are unfiltered or with pulp, and fruit juice is usually healthier than soda, but even juice with a little bit of fiber left in it doesn’t compare nutritionally to a serving of whole fruit. Whole oranges and orange juice provide the perfect opportunity to compare the differences between the two. Check out the picture above of the three glasses of processed oranges. The glass on the left contains the juices of three hand squeezed oranges while the two glasses on the right contain the pulp and juice of three whole oranges that I liquified in a blender (minus the peel). Three whole oranges produced almost twice the volume of material as the juice alone. That extra material is the pulp and pith which contain a number of important nutrients that work together to make the whole orange a highly nutritious food. To start, the high fiber content of a whole orange helps the body properly process the high fructose content of the juice. The fiber actually blocks some of the sugar from being absorbed, which makes the orange more nutritious for the amount of calories it contains. The fiber also makes a whole orange much more filling than the juice (it’s far easier to consume several glasses of high sugar orange juice than several whole oranges). If you eat a whole orange you’ll also be more satisfied and less hungry for calorie-dense, nutritionally-deficient food later on. In addition to the benefits of the extra fiber in the pulp, a whole orange contains numerous health promoting micro-nutrients that aren’t found in the juice alone. One of the most researched is a flavanoid called hesperidin, which is concentrated in the pulp and inside of the peel. Hesperidin shows promise as an anti-inflammatory, in lowering blood pressure, and in promoting healthy cholesterol. One animal study also found that a diet rich in orange pulp increased bone density! I’m not saying that we should never drink orange juice again; studies have shown that fresh-squeezed orange juice has significant anti-oxidant properties. It’s just important to know that the juice isn’t as healthy or satisfying as the whole fruit. Juices and other drinks can be a hidden source of surplus calories for those trying to live healthfully. A diet that emphasizes whole fruits over juices contains fewer sugary calories and more health promoting nutrients! In the last several decades, we’ve seen a substantial increase in the number of people struggling with obesity and diabetes (both connected to what’s been called metabolic syndrome). Doctors and nutritionists who follow the dictates of mainstream medicine (largely influenced by pharmaceutical and industrial food companies) place most of the blame for this unhealthy trend on insulin. According to the logic, insulin resistance (and therefore an increased amount of insulin in the blood) is correlated to diabetes and weight gain; therefore, we should all do what we can to prevent our bodies from producing too much insulin. The glycemic index was developed to help us meet this goal. The glycemic index is essentially a database that rates foods based on the amount of insulin response they cause. Glucose is the most powerful catalyst of insulin production, so the peak of the scale is based on the insulin response caused by pure glucose (hence the word “glycemic”). Foods that cause especially high insulin spikes are high on the glycemic index and are labeled as bad for health. This includes foods like refined sugar and white bread, but it also includes potatoes, whole grains, milk, rice, and many fruits. Here’s the deal, insulin is released more or less every time we eat; it’s a vital hormone that signals our cells to use food for energy. We can’t live without it! While there’s definitely a correlation between insulin resistance and metabolic syndrome, the research is less than clear on the actual causes of weight gain and diabetes. There are a great variety of opinions within the medical community on exactly what causes insulin resistance, and evidence to support the theory that insulin causes weight gain is actually lacking or contradictory. Some researchers are of the opinion that diabetes and weight gain (and the cardiovascular diseases that go along with it) are purely the result of excess energy consumption. Others, such as Dr. Lustig, believe that refined fructose and high fructose corn syrup are primarily to blame. Moreover, there are a number of studies that indicate that foods that are high on the glycemic index have an important part in a healthy diet and can actually support weight loss! It turns out that Insulin response might not contribute to weight gain as much as the type or quality of food. A number of observational and long term studies have found that people (such as Kitvians, Japanese, and members of various African and indigenous tribes) who consume high quality foods that are high on the glycemic index, such as yams, potatoes, honey, and whole grains, have very low rates of diabetes, obesity, or cardiovascular disease. Moreover, high-glycemic whole foods like potatoes, corn, whole wheat, and rice have had an important role in healthy human diets for thousands of years. While Americans have a particulary high rate of obesity and diabetes and also consume a large proportion of foods that are high on the glycemic index, it seems that the poor quality of foods we consume is more to blame than the amount or type of carbohydrates that these foods contain. Most Americans eat a high volume of refined sugar (sucrose and high fructose corn syrup), white wheat, and grains that are fried in refined, poly unsaturated oils, instead of fruits, vegetables, whole grains and other unrefined foods. So, instead of trying to follow the poorly supported logic of the glycemic index by cutting out healthy foods like yams, whole grains, fruit, or raw honey (creation-based foods), start by cutting out the high-calorie/low nutrient industrial foods that are intimatey linked to disease (especially refined sugar, grains, and oils). Healthiest holiday dessert award: PUMPKIN PIE! I don’t know about you, but pumpkin pie is one of my favorite holiday desserts. It goes well with coffee, has great texture, and has just the right amount of sugar and spice. While traditional pies usually call for 1 cup of refined sugar and a white flour crust, we’ve come up with a recipe that uses creation-based ingredients and contains only about 17 grams of sugar per slice instead of the traditional 35 grams! Our recipe uses honey, stevia, and a whole wheat crust. If you’re gluten intolerant, don’t worry–we also have a recipe for a crust made of almonds. Sift flour and salt together into a large mixing bowl and chill. Chop cold butter into small pieces and add to the chilled, dry ingredients until it resembles a coarse meal. Sprinkle cold water over the mixture, one tablespoon at a time and knead only until dough forms. Shape dough into a ball and cut in half. Shape both halves into small discs and wrap in wax paper. Refrigerate for 30 minutes before rolling. Important: Keep everything as cold as possible and knead only as necessary. Mix ingredients together by hand and press evenly into greased pie dish. Bake in pre-heated oven (325 degrees) for a few minutes while mixing pie filling. 1) Cut pumpkin in half and remove seeds. Place open sides down in a baking dish with a 1/4 inch of water at 325 degrees for 30 to 40 minutes, or until flesh is tender. Scrape cooked pumpkin flesh from skin into mixing bowl and mash into puree. 2) Add remaining ingredients to pumpkin puree and mix well after adding each ingredient. 3) Pour mixture into unbaked pastry shell and place aluminum foil or crust shield around edge of crust to prevent it from burning. 4) Bake at 450 degrees F for the first 10 minutes then reduce the oven temperature to 350 degrees F and bake for an additional 40 to 50 minutes, or until a toothpick inserted near the center comes out clean. Remove foil or crust protector around 20 minutes before the pie is done in order to achieve a golden brown crust. Let pie cool and set. Refrigerate overnight for best flavor.